“Back in the ol’ days” you had guitar and steelguitar duos such as Speedy West & Jimmy Bryant, Santo & Johnny, Jimmie Rivers & Vance Terry, Danny Gatton and Buddy Emmons, Buddy Emmons & Lenny Breau, who are playing out in dramatic improvisations in a wide variety of musical styles, from Hawaiians to cartoons, from jazz to rockabilly, Western swing to classical. Harm van Sleen (pedal steel & vocals) and myself (guitar & vocals) have the humble opinion that it’s about time to breathe new life in this almost extinct tradition. 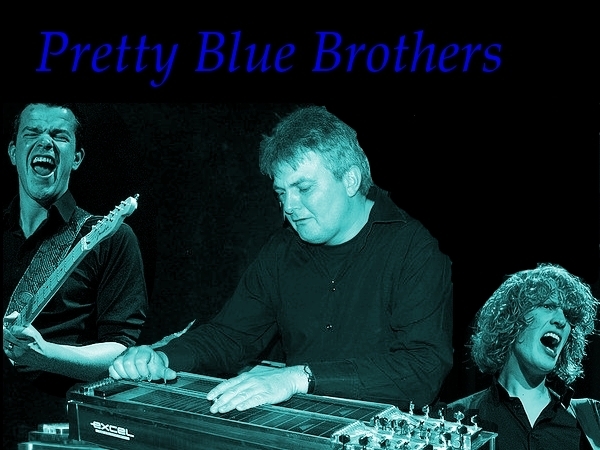 Ab Hansen (bass & vocals) is equally enthusiastic, and the Pretty Blue Brothers were born. Besides many songs that were taken from the repertoire earlier mentioned masters we also play modern pieces that are good for guitar-and-steel duets borrowed from bands like the Allman Brothers and John Mayer; Shure we play our steel guitar classics, but also some unexpected covers. Whe are a strange the duke in the bite if you compare us with the ol’ masters, and that’s because all band members sing, and that is a refreshing break from all the strings-violence. The band performs as a trio but is specially enhanced for Bacchus with Cees Tas on drums and / or percussion. July 5 will live to see this band for the first time at Bacchus in Aalsmeer, we hope to see you there!